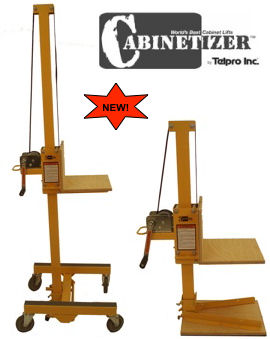 The GILLIFT™ Cabinet Lifter adapts to the way you want to install your cabinets. The GILLIFT™ cabinet lift saves money since you don't need extra workers to help you. The Gillift® is the original cabinet lift. Designed by a cabinet maker, allowing him to easily and effectively install his own cabinets. He soon learned he could make more money just installing cabinets and went into business as an installer. After rising demand from other installers for the Gillift® he started making them. The Gillift® is made out of anodized aluminum and uses high grade plywood where the lift come in contact with the cabinets. The Gillift® is sold in three ways. The Model 70-1 is set up if you just want to hang your uppers after you have set your bases. The Model 70-2 is set up to hang your uppers first before your base units are in place. The rolling base can also be used to move your base units into position. The Model 70-3 includes the counter base and the rolling floor base allowing you to install your uppers before or after the base units have been installed. The Gillift® can also be fitted with the optional Drill Drive model 1013. This will allow you to raise and lower your lift effortlessly with a drill.